Each Claybord hinged box is completely customizable and includes Ampersand's signature Claybord smooth surface on the lid's exterior and unfinished wood sides. 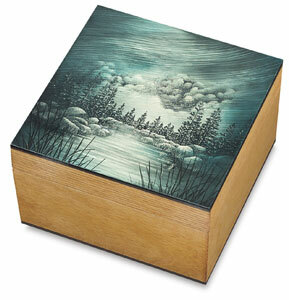 Decorate the top with any water-based paint, or try collage, photo-transfer, or other decorative techniques. Boxes are 3" (76 mm) tall, measured on the outside. Hinges are packed inside for attachment later. This style is perfect for home décor, or as an artful gift. Ampersand's original and most versatile panel, Claybord, has an ultra-smooth kaolin surface that accepts a wide variety of media. The absorbent surface allows for quick drying time of inks and paint. The real advantage of Claybord is how the surface can be manipulated; ink can be completely erased without affecting the integrity of the surface using Ampersand's oil-free steel wool. Sgraffito techniques can also be used on Claybord, something that cannot be achieved on paper. Ampersand manufactures a wide variety of archival artist panels. There is a surface for every artist, every medium and every technique. Watch this video to learn which of these boards is right for you!